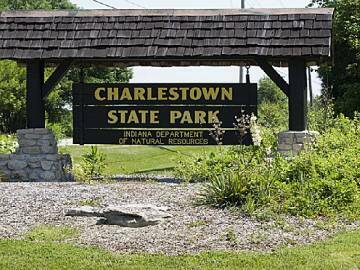 Description: Charlestown State Park is located between Jeffersonville and Hanover, Indiana. (Just east of Louisville, Kentucky). This park has lots of trails to hike and bike. It has a large boat ramp on the Ohio River. RV campsites have either 30 amp or 50 amp service. All RV sites have water and electric. Some sites have sewer hookups but not all. The town of Charlestown is small and there are not many choices of restaurants in town. Just a 15-minute drive to the west is Jeffersonville and across the river in Louisville are some of the best restaurants around.